The beautiful and historical name Mount Edelstone is a translation from the German Edelstein meaning gemstone. The dry-grown ungrafted centenarian vines were planted in 1912 by Ronald Angas, a descendant of George Fife Angas, who founded South Australia. Johann Menge, a German geologist, mineralogist and gardener explored and surveyed the regions around Adelaide in the new free colony of South Australia, on behalf of George Fife Angas and Colonel William Light. This land was granted to George Fife Angas shortly afterwards, together with large tracts of land in the most fertile region along the North Para River in the Barossa Range. The land passed to his great-grandson Ronald Angas who established a large orchard and vineyard on the eastern slope of Mount Edelstone near his homestead Hutton Vale. Cyril Henschke was offered the grapes from Colin Angas, the son of Ronald Angas, from the early 1950s. 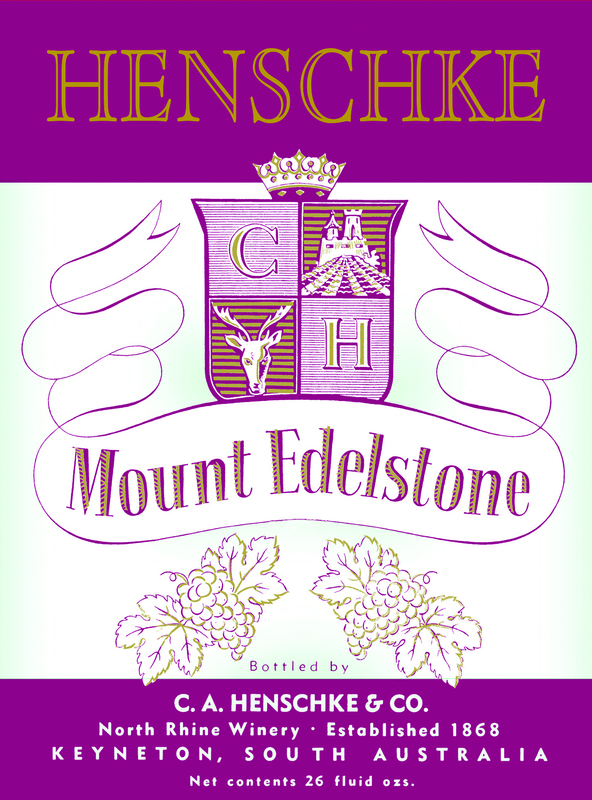 The first Mount Edelstone bottled as an individual vineyard wine was the 1952 vintage. It was simply labelled as Mount Edelstone Claret bottled by C A Henschke & Co, North Rhine Winery, Keyneton, South Australia. The back label read, “This wine is made from shiraz grapes grown at Mount Edelstone Vineyard, Keyneton. The 1956 vintage won First Prize in Adelaide, Sydney and Melbourne. It stormed the national wine show circuit and announced its formidable presence at the forefront of the pioneering days of Australian red wine. When Cyril purchased the vineyard from Colin Angas in 1974, Mount Edelstone was already well entrenched as one of Australia’s greatest shiraz wines. The vines are planted on their own roots, are dry grown and yield an average of 3 t/ha (1.25 t/acre). The vines are planted on a wide spacing of 3.7m between vines and 3.7m between rows. The original one-metre trellis consists of two wires which carry two to three arched canes with a bud number of around 50 to 60. The foliage is allowed to hang down to form a drooping canopy, which helps to reduce shoot vigour. In 1989 Prue trialled 10 rows of a Scott Henry trellis in which the shoots from the top wire canes are trained upwards between foliage wires and the shoots from the bottom wire canes are trained downwards between foliage wires. The effect of this solar panel system is to provide a significant increase in exposure of the leaves and fruit to the sun, thereby increasing fruitfulness and promoting earlier ripening and a greater increase in colour and flavour of the fruit and improved tannin maturity. This trellis has had such a positive impact on the quality of the wine that over three quarter of the vineyard has now been converted to it. Other trellis trials were also being evaluated including VSP (Vertical Shoot Positioned), high single wire, Smart Dyson and ballerina. The Mount Edelstone vineyard is underlain entirely by laminated siltstones of the Tapley Hill Formation. The soils are fine sandy loams over deep gravelly medium red clays. The soil layer goes to a significant depth before reaching the bedrock. The pale mottled clay/clay loam layer indicates that a large degree of leaching and periodic waterlogging has occurred. Rocks beneath the red clay soils are schists of Cambrian age. These are metamorphosed mineral-rich sediments, originally deposited in a shallow sea, then deeply buried, and finally pushed back up to the surface where they weathered to produce a thick soil layer. Originally the ground was cultivated for weed control. Nowadays the vineyard has a permanent sward including native grasses. A mulch of wheat straw is used under the vines to retain soil moisture, build up organic matter, and inhibit weed growth. Prediction of disease pressure through an integrated pest management program results in minimal chemical input in the vineyard. The vineyard management incorporates organic and biodynamic practices, including composted grape marc, cow pit peat, 500 and 501 preparations, milk whey and bicarbonate sprays. The grapes are picked mid to late April at a sugar level of around 24°Bé. There is always a remarkable acid/pH balance from this vineyard. The anthocyanins in the berries are very high which indicates the superior quality of the Mount Edelstone shiraz. Prue began a mass selection program in 1986 to identify the best vines for propagation. With her assistant Uschi Linssen she tagged and mapped selected vines in the vineyard for viticultural features during the growing season using criteria such as even budburst, absence of the wood-rotting fungus eutypa, bunch numbers per shoot, the evenness of flowering and veraison, virus, and maturity and colour figures in the fruit. It was painstaking work, which also included a similar selection of the Hill of Grace vineyard. Cuttings from the selected vines were planted in the nursery. The research work is ongoing and is a scientific program that has taken up to 30 years to work through. Cuttings have been taken from the nursery vines, propagated, and planted as needed in the vineyard to replace old vines that have expired from dying arm, Eutypa lata. Shiraz, on own roots, dry grown. Vines sourced from pre-phylloxera material from Joseph Gilbert's nursery; believed to originate from James Busby's selection. Planted in 1912 by Ronald Angas.